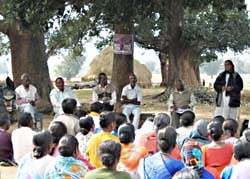 January 2009, 40 people from many village came together to hear about mining projects. 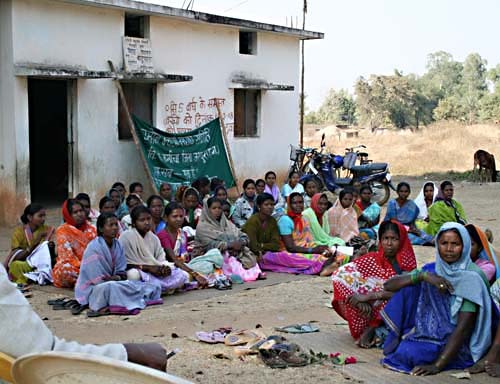 January 2010 three hundred women and man from dozens of villages came together in a meeting in Musgutri, a village in the Jashpur district of the Centre-Indian state Chhattisgarh. They discussed the mining projects and the displacements it brings. Three years ago a land survey is done by helicopters. This year the roads are broadened and new bridges are constructed. Big trucks transport huge factory parts. Everything gets ready to start mining and processing of iron ore, coal, gold, bauxite and so on. At the same time fundamentalist young Hindus demonstrate, shouting slogans like: 'We will crush everyone who opposes development'. At the village meeting several social workers gave the newest information about the land grabbing plans of the big Indian company Jindal for large scale mining. One well informed activist explained that officers from the administration or from companies always need a written permission from the government for survey in public land. 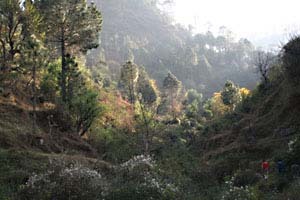 Survey on village and private land is only allowed with the permission of the owners. Villagers already chased away surveyors who could show the right papers. The villagers confiscated their survey apparatus, brought it to a government office and complained about the illegal survey. People from a village near Kansabel told the meeting how they successfully opposed the construction of a power line for a Jindal factory. When the first big cable was brought in the soil, they didn't know what was happening and how to resist. But when the company came back for a second and third one and started cutting trees, the villagers didn't allow it. January 2010, a same meeting at the same place. Now there were 300 people. One year before, January 2009, there was a same sort of meeting at the same place. At that time there were only forty villagers. Now three hundred! At that time the villagers had no idea what was happening and were listening only. Now they told in public about their actions. 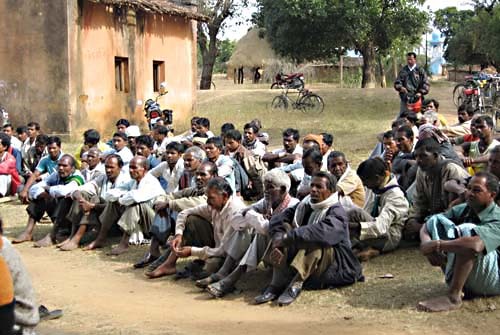 At that time there had been only one big demonstration, in September 2008 at Jashpur with about 20.000 people. Last year there were four huge rallies. At February 2009 10.000 people demonstrated in Bagicha; at March 100,000 in Jashpur; and at June almost 100,000 people in Kunkuri. 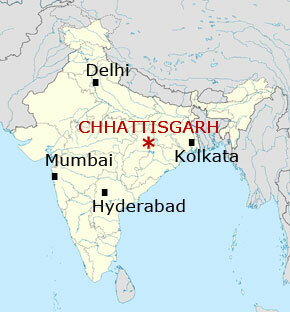 In October there was a demonstration against displacement at the state capital Raipur, 450 kilometers from here. 10,000 people from all over the state came together. From them 1000 came from the Jashpur district. Everyone paid her own travel costs of 600 Rs with the help of their own family or friends. They told about actions they had done themselves already. 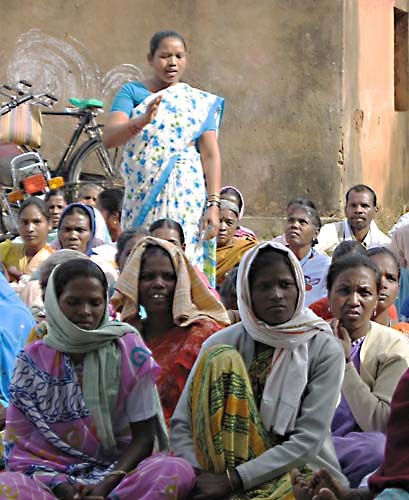 The struggle committees in the villages are mixed, but in the Jashpur district social workers of the Catholic Church play an important role in bringing the people together. They encourage the villagers to fight for their rights and to participate in demonstrations. 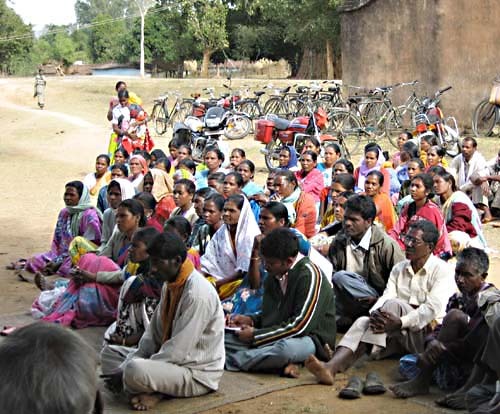 They also organise legal trainings about tribal rights, human rights and land rights. In this district quite a lot of the Adivasis became Christians during the twentieth century. They had a difficult life as daily labourers at the big farms. The church gave them their dignity back. Many tribal children went to the Christian schools and got good education. Later on they got jobs at the administration, by the reservation policy of the Indian government. 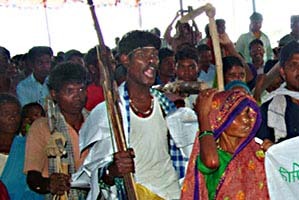 Almost all priests and nuns are tribals themselves and are very committed to the struggle of the poor Adivasi farmers. Nowadays the position of the church becomes more and more difficult. 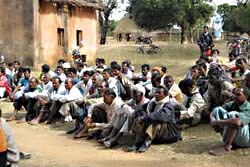 People from the rightwing Hinduism party BJP and the rightwing Hinduism political organisation RSS encourage Adivasi villagers to claim back the land their grandparents gave the church to build schools and hospitals. The BJP government also makes difficulties with paying the Christian schools the normal financial state subsidies. The social workers not only discuss about mining projects. They do a lot of construction work in the villages. That is their first duty. 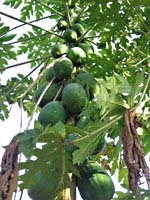 They have agriculture projects, village shops, women groups and so on. They also organised big intercultural festivals for better understanding between the different communities.